Wessling (Germany), in August 2016 - hyperMILL®, the CAM/CAD solution from OPEN MIND Technologies AG has now been certified by Autodesk Inc. 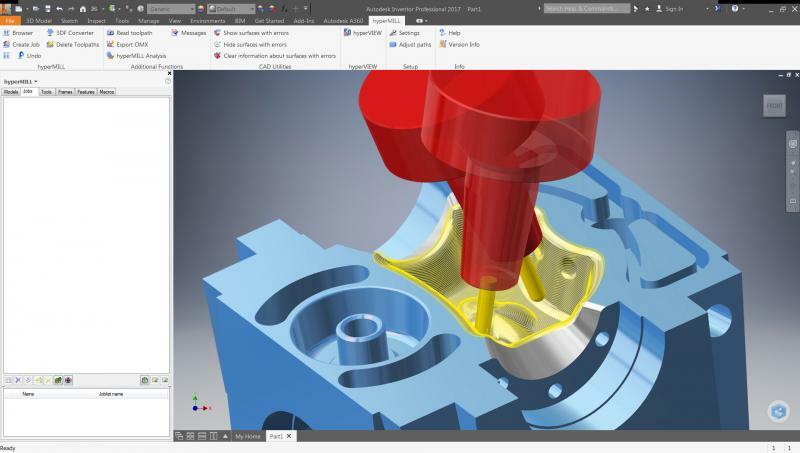 This means that an integrated and fully autonomous workflow is ensured when converting files from Inventor 2017 software to hyperMILL®.This makes transition from Inventor through the hyperMILL® CAM system and on to the CNC machine tool completely seamless. The necessary data association was confirmed following a rigorous test procedure for the latest edition of hyperMILL®, version 2016.2. This was fully affirmed on the same database to increase the common access, speed and efficiency. This new authentication ensures that errors are avoided and the workload for the end users is reduced overall. The big advantage for customers is the changes in the CAD data that leads to an automatic update of the CAM operation. This is particularly convenient for Inventor users as it allows them to invoke the entire CAM functionality of hyperMILL® within this familiar CAD interface.